* Works completely offline! No internet connection needed! Perfect for your studies! 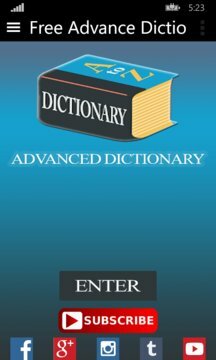 * Thesaurus with over 290,000 straightforward definitions. 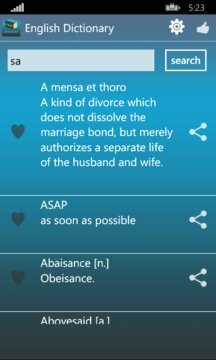 * Listen to the definitions using American or British accent with Window's built-in Text-to-speech synthesizer. * Read definitions with two font sizes. Optimized for both phones and tablets! * Saves your phone's data. The app installs itself automatically in the SD card if possible. * Improve your vocabulary! The ideal lexicon to find American English synonyms/antonyms, word etymology, verbs, and more. Q: How can I share a definition? Q: How can I change the speech accent? If not installed, your device may ask you to install the TTS engine. An internet connection may be required. We recommend installing it before travelling as roaming data tariffs may be very expensive.